classes. Watch the front page for dates and times. We accommodate your needs. You are capable of benefiting from this instruction without fear of injury. Please bring water container; we'll have fresh, chilled spring water available. It's a long class, bring a snack. If we end up providing simple fruit etc. we'll update. Small student to instructor ratio; space is limited. Pre-register please. 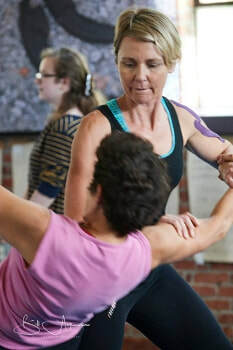 Women's Self-Defense from Aikido of Gainesville will teach you effective, powerful techniques in a small-group workshop setting. You will be taught and will repeat the techniques many times so they become part of your body memory. You will learn to take the balance of your attacker no matter their size and escape. It doesn’t take a lifetime to learn how to survive a physical attack. 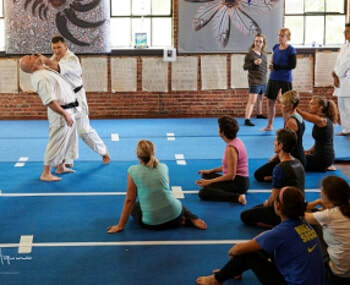 Sensei Tom Huffman has taught Aikido in Gainesville since 1997 after a 20 year military career. During six years in Japan he learned from masters in Aikido, Iaido, Batto and Karate. He holds a 4 degree black belt in Aikido and additional black belts in swordsmanship and karate. Asst.Instructor Keith McInnis is a former law enforcement officer, trainer and lifelong martial artist. 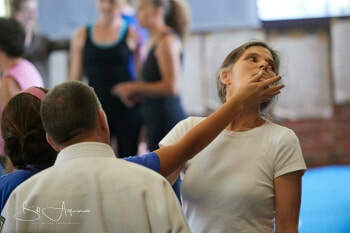 We have designed this personal defense curriculum based on past experiences and with input from many trainers.